Medium of exchange (such as Bitcoin). Contractual right to transact via some protocol (such as Ethereum). De facto security with cash flow claims (equity shares residing on a blockchain). The most common method of introducing a new cryptocurrency is an Initial Coin Offering (ICO). Also, design updates to an existing protocol that are not backward-compatible create a new cryptocurrency (hard fork). Cryptocurrencies such as Bitcoin and Ethereum have distributed, permission-less ledgers, with no designated leaders or elected boards to ensure smooth operation and updating. They rely on crowd-sourced, consensus-based networks of validators incentivized by cryptocurrency token rewards. The original Bitcoin blockchain employs a proof of work protocol, requiring solution of a computationally expensive problem (mining) to validate network transactions. The three largest cryptocurrencies by market capitalization are Bitcoin ($187 billion), Ether ($45 billion) and Bitcoin Cash ($26 billion), with respective average 2017 daily dollar volumes about $4.8 billion, $0.8 billion and $0.8 billion. Bitcoin, Ethereum and Litecoin have steadily gained traction as methods of payment, but they are far too volatile to qualify as currencies. A better label for them is crypto-assets. Risk of theft by hacking further diminishes their validity as a safe store of value. Bitcoin has a first-mover advantage. Valuation spikes in Bitcoin and Ether are at least partly due to their early availability as intermediaries for acquiring other cryptocurrencies. Investing in a cryptocurrency is a bet on whether the associated blockchain protocol offers a material economic advantage over existing ways of doing business, is scalable and meaningfully limits the supply of coins. Three ways to take direct positions in cryptocurrencies are: (1) mining; (2) buying via an ICO; and (3) buying in a secondary market (crypto-exchange). The three most liquid crypto-exchanges have average daily dollar volumes about $3.5 billion (Bitfinex), $2.4 billion (Bitmex) and $2.2 billion (Bithumb). Buying and holding cryptocurrencies involves creating a digital wallet, linking a credit card or bank account to the wallet, creating a trading account on a exchange and depositing funds into the trading account in a baseline cryptocurrency. 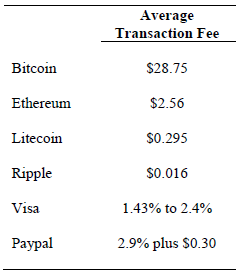 See the table below for a sense of transaction fees. Government reactions to cryptocurrencies vary widely around the world. Countries such as the U.S. and Canada largely tilt toward innovation and away from regulation. The following table, extracted from the paper, compares average secondary market transaction fees in U.S. dollars for leading cryptocurrencies across platforms. In summary, investors should view cryptocurrencies as risky, competing and somewhat illiquid bets on potential improvements over conventional ways of doing business worldwide, not stores of value. Cryptocurrencies are difficult to value, but perhaps thereby amenable to technical trading (see “Timing Bitcoin with SMAs”). As implied/stated, cryptocurrency exchanges are not as liquid or deep as those for conventional assets. See also “The IMBC Portfolio”.